Have you ever walked by a polish in a store and heard it calling your name? That's what happened to me with the FingerPaints - Limited Edition Enchanted Winter Collection. I purchased three of these from Sally Beauty. I really think I am going to have to go back and grab the other three! 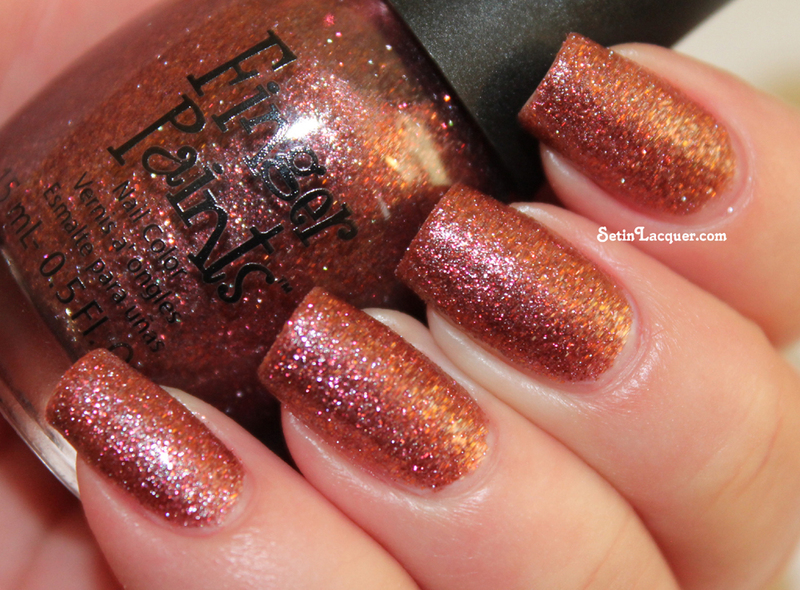 The FingerPaints Limited Edition Enchanted Winter Collection features six trendy, textured shades. They have tons of microglitter to make them sparkle and shine. I used two coats and they applied wonderfully. I took photos of them with and without top coat. The top coat makes the sparkle pop even more. If you aren't a fan of textured polishes (and these are only slightly textured) don't let that stop you. These are gorgeous! Sparkle in the Sky: is a gorgeous deep navy blue with tons of sparkle. It really does look like the night sky! Now let's look at it with top coat. What a shine! Winter Chill: is a deep black shade with amazing glitter and texture. If you like textures you are going to love this one! Now let's check it out with top coat. Enchanted Winter: is a rosy, bronze shade. I really am not sure how to explain it. But it is quite stunning. Now let's take a look at it with top coat. I am definitely going to have to pick up the other three from this limited-edition collection. Right now they are on sale at Sally Beauty for $3.99. These polishes were purchased by me. All opinions are my own. Due to differences in computer monitors the colors you see may be slightly different from the actual color. So I decided to do a comparison of the polishes. This is three coats on all fingers. I could have perhaps gotten away with 2 if I had applied a base coat. They are all really similar. The NOPI and the Fingerpaints are slightly more green. They all applied very well. Although I think the Wet n Wild is a little thinner than the others. How close do you think they are? Sorry it has been a while since I have updated. I have had some family emergencies. Let me just jump to the wonderful Finger Paints color I used. 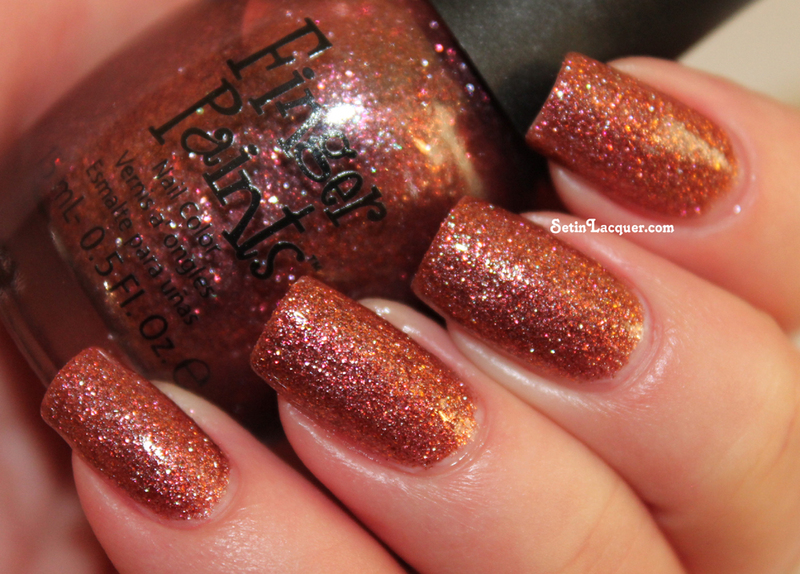 Finger Paints "Color Inside the Lines" is an amazing, vibrant, gorgeous pink. The application is great. Two coats provided amazing coverage. Finger Paints "Color Inside the Lines"
Then I added a gold line using Sinful Colors "Pot O Gold" Nail Art polish. The I used Essie "Cosmo's PSS Shimmer" on the tip. It is much more pretty in real life than in these photos. The brush in the Sinful Colors "Pot O Gold" is phenomenal. It is truly a nail art brush. Essie's "Cosmo's PSS Shimmer" is an amazing burst of gold shimmers and applies wonderfully. Sinful Colors "Pot O Gold"